Hanoi from Hong Kong was a shock. We got a hint of how mental it is here when the cab to our hotel came to an abrupt stop in front of a truckload of chickens parked across the motorway; from then on it was in at the deep end. The heat whacks you in the face, there is no discernible way to cross the heaving streets, and the language barrier made it nearly impossible to order that crucial beer on our first night. If I’m honest, I hated it- and missed the order and cleanliness of Hong Kong. It probably had a lot to do with staying in a hotel away from people our own age, and we spent most evenings hanging out at the backpacker hostel down the road. The turning point came on the third day: tired and hungover from the hostel bar crawl the night before, we avoided the midday heat in Tamarind, a veggie cafe in the Old Quarter. We emerged after a good meal and a couple of mango lassis (and agreeing to come back and speak English with the friendly staff in exchange for our dinner) completely relaxed- suddenly walking in the path of oncoming traffic came naturally. It also helps a great deal that the staff, like most of the people we’ve met so far, are constantly smiling and keen to talk to you to improve their English. A disproportionate amount of our time here has been spent seeking out Hanoi’s gastronomic delights, and we have two favourites. At Bún bò nam bộ you can get a plate of delicious crab spring rolls, noodles and a beer for around £1.50. 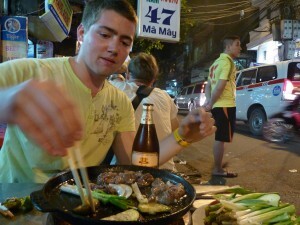 For a DIY barbecue of beef and vegetables cooked with a mix of lime juice, sugar and pepper, 47 Ma May is the place to go. The one thing I was looking forward to most was touring Halong Bay, and it didn’t disappoint. Kayaking, cave exploring, swimming and sunbathing in the afternoon, squid-fishing (unsuccessfully), karaoke and drinking at night- and that was just the first day. I’m pleased we decided to stay for 2 nights because next on the agenda was a trip to an oyster farm, more swimming and beach-bumming, plus a bike ride and jungle trek on Cat Ba island, where we stayed in a hotel. Our guide was brilliant and showed a couple of us round Cat Ba town after dinner, where we drank green tea watching kids beat drums and do the dragon dance in preparation for the Mid-Autumn festival that weekend. All of this set against a backdrop of looming rock formations making it impossible to stop taking pictures. 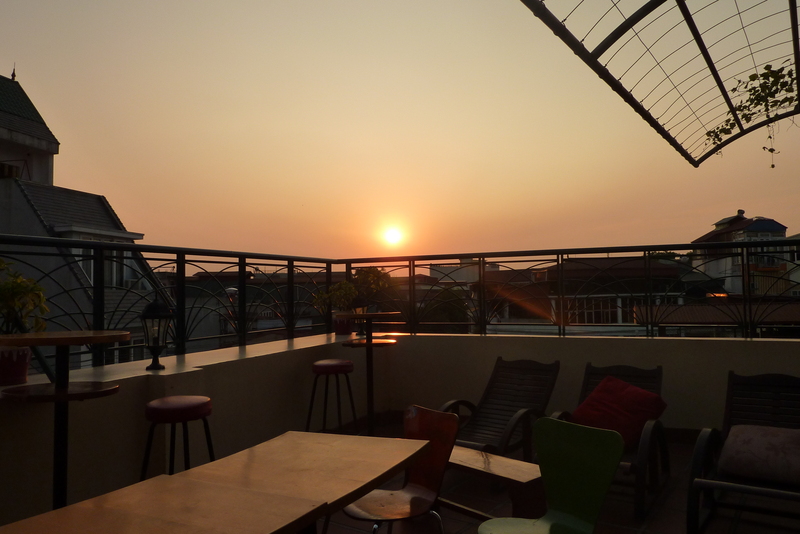 Now we’re in the downtown Hanoi Backpackers Hostel, and we’re taking full advantage of the chilled atmosphere and great nightlife. The one bad thing about staying in such a great place is that we never want to leave!